The Beast almost met The Money on The Grandest Stage of Them All. 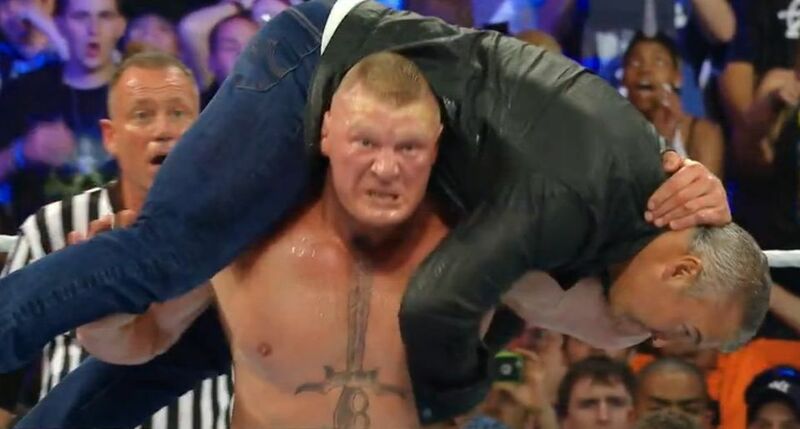 After Brock Lesnar tried to drive his elbow into Randy Orton's brain at the end of Summerslam, Lesnar was confronted by SmackDown commissioner Shane McMahon, who was basically like--and I'm paraphrasing here--"Dude, not cool." . Let's take a quick peek at how that turned out, shall we? Shane demanded restitution, Both for himself and for Randy's scalp. Stephanie McMahon, commissioner of Raw, fined Brock 500 bucks. The "press release" is still up on WWE.com. Brock Lesnar’s brutal SummerSlam main event assault on Randy Orton has cost The Beast Incarnate $500. Raw Commissioner Stephanie McMahon confirmed on Monday night that Lesnar would face repercussions for his vicious actions against The Viper at The Biggest Event of the Summer. The WWE Universe learned on Tuesday’s SmackDown Live Pre-Show that the $500 fine was set by Stephanie. Is the fee enough to satiate SmackDown Commissioner Shane McMahon’s peace of mind for the heinous act inflected upon one of his show’s top Superstars? Is this seemingly paltry sum an insult to Shane and SmackDown Live? How will Lesnar’s fine impact the already strained relations between Team Red and Team Blue? As you might have guessed, Shane McMahon wasn't too happy about the piddling fine, and said so in an interview on the August 23rd edition of SmackDown. Rumblings began in the rumor mill, and it was largely assumed that we were headed toward a match between Brock Lesnar and Shane McMahon at some point in the future. The following Monday on RAW, Lesnar's advocate Paul Heyman addressed the situation in an in-ring segment with Stephanie McMahon. It was mostly gobbeldy-gook.Seriously, watch that clip if you don't remember the segment. It was all over the place. Heyman started off paying the fine in singles, Stephanie McMahon played babyface, a nebulous shadowy "board of directors" was invoked, and it kind of ended up with Paul Heyman convincing Stephanie that Brock Lesnar was too valuable to the RAW brand to discipline further. We never heard anything more about this angle, and the next time we saw Lesnar, he was challenging Goldberg to a "Fantasy Warfare Just Got Real" match at Survivor Series, where he would be shockingly squashed in less than 90 seconds. So what happened? Was there ever really a match in the works between Brock and Shane-O Mac? According to Dave Meltzer, yup. And it was going to be at WrestleMania 33. Meltzer said on Wrestling Observer Radio that the plan was still a possibility, right up until Goldberg signed on through Mania. If Goldberg had been a true one-off, Lesnar would have gone over at Survivor Series, and somehow we would have got back around to the Brock/Shane program. Or maybe not. Meltzer said that Lesnar got himself out of the Shane match, and that Brock "certainly didn't want to do it." Who knows? Maybe he was afraid he would accidentally kill his boss's son. Or maybe he knew that if he just bided his time, he'd wind up in a championship match at Mania with a 50 year old with a over-active sweat glands, and he'd be booked to win, and maybe even get a year-long title reign out of it.